Figure 1. 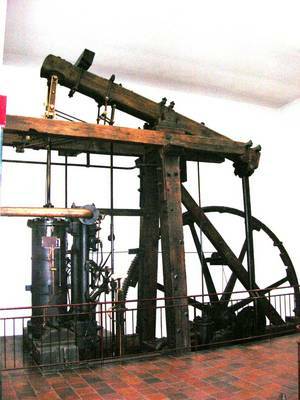 James Watt's industrial steam engine, 1788. Figure 2. Operation of a steam engine. Steam engines, such as the ones formerly used to drive locomotives, operate through the production and expansion of steam as water is heated. A coal- or wood-fired furnace (1) heats a water-filled boiler (2), producing steam. The steam rises and is forced, via a steam dome (3), through a series of tubes to the cylinder (4), where it drives the piston (5) in a reciprocal motion. Linked to the piston's connecting rod (6) is a slide valve (7) that at one stage allows steam to enter the cylinder (as shown), blocking off the exhaust port (8). This creates pressure that forces the piston forward, at which point the slide valve is in a position where the exhaust port is open and the steam escapes. The motion of the wheel forces the piston back and the cycle begins again. Figure 3. Main components of a steam engine as developed by James Watt. The steam engine was the first important heat engine, supplying the power that made the Industrial Revolution possible, and the principal power source for industry and transport (notably railroad locomotives and steamships) until largely superceded in the twentieth century by steam turbines and the various internal-combustion engines. The steam engine is an external-combustion engine, the steam being raised in a boiler heated by a furnace; it is also a reciprocating engine. There are two main types: condensing, in which the pressure drop is caused by cooling the steam and so condensing it back to water; and non-condensing, in which the steam is exhausted to the atmosphere. The power of steam has been known since ancient times. In those early days it was called 'water smoke'. As an example of this early knowledge, Archimedes, who lived in the third century BC, built a sort of 'steam gun' which could shoot large missiles. But it was Leonardo da Vinci who first studied extensively the power of steam. He built a machine which he called 'archituono' consisting of a big metallic cylinder. It worked very simply. Water was poured into the cylinder, which was then hermetically sealed and put over a fire. When the water boiled, it produced steam which could find no outlet, and the cylinder exploded with a great noise. Leonardo had demonstrated that fire and water together could produce a strong force much more powerful than that of man or animal. But the credit for having demonstrated the power of steam goes to the French scientist Denis Papin. In the last years of the seventeenth century Papin showed to British scientists his 'pot' which became known as the 'steam digester of Papin'. With this device, he showed that the pressure of steam could move heavy weights. The steam digester consisted of a cylinder with a lever arm hinged at one end and with a weight at the other. The end of the cylinder had a small valve connected with a piston and fixed to the lever. The pressure of steam lifted the piston, which in turn lifted up the lever arm with the weight attached. It took very little time to develop the principles of the steam engine from Papin's steam digester, but it took a much longer time to work out all the details of it. The first major precursor of the steam engine was Thomas Savery's steam pump (1698), which worked by the partial pressure vacuum created by condensing steam in closed chambers. It had no moving parts, however, and the first working reciprocating engine was that of Thomas Newcomen (1712): steam was admitted to the cylinder as the piston moved up, and was condensed by a water spray inside the cylinder, whereupon the air pressure outside forced the piston down again. James Watt radically improved Newcomen's engine (1769) by condensing the steam outside the cylinder (thus no longer having to reheat the cylinder at each stroke) and by using the steam pressure to force the piston up. He later found that, if steam were admitted for only part of the stroke, its expansion would do a great deal of extra work. (The principles involved were later studied by Carnot and became the basis of thermodynamics.) Watt also invented the double-action principle – both strokes being powered, by applying the steam alternately to each end of the piston – the flyball governor, and the crank and "sun-and-planet" devices for converting the piston's linear motion into rotary motion. The compound engine (1781) makes more efficient use of the steam by using the exhaust steam from one cylinder to drive the piston of a second cylinder. Later developments included the use of high-pressure steam by Richard Trevithick and Oliver Evans. 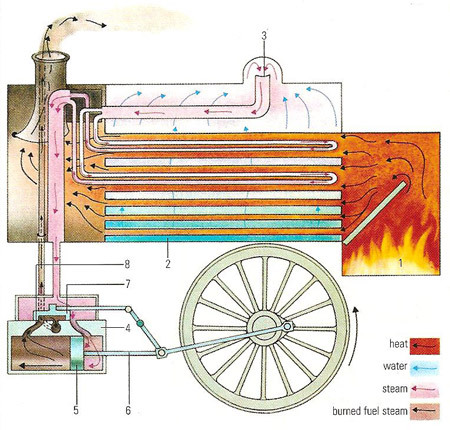 As developed originally by Watt, the steam engine system consists of three main parts: (1) the boiler where steam is generated and passed to (2) the cylinder in which the piston operates (3) the condenser where the steam has already been used becomes water again and then returns to the boiler. Figure 3 shows the section of a cylinder. The piston, which moves along the length of the cylinder, divides it into tow compartments which in the illustration are marked A and B. The pipe marked C brings the steam from the boiler to the cylinder; the pipe marked D takes the steam from the cylinder to the condenser. If we open the taps marked R and S in the illustration this is what happens: the steam formed in the boiler enters the cylinder through the tap marked R; it fills up space A in the cylinder and it pushes the piston in the direction marked by the arrow. The steam in the compartment marked B which has previously done work in moving the piston and is a low pressure is pushed by the piston through the tap marked S into the condenser. If, on the other hand, we close taps R and S and open the two other taps not marked with letters, the piston will be pushed in the opposite direction. If, further, all the taps were to open and close automatically in the correct sequence, the piston would move across from one side of the cylinder to the other and back again. The piston is connected with the wheels by a connecting rod, which converts the movement of the piston in the cylinder into the rotary movement of the wheels. Although the steam engine had now been made practically possible, it was not until 1768 that Nicholas Cugnot, a Frenchman, applied its power to a land vehicle by building a vehicle with three wheels and with a steam engine mounted on it.